Kutch has always been at the centre of natural calamities. Often becoming victim of drought, cyclone, earthquakes etc. Sanstha has always been at the forefront when it comes to relief and rehabilitation work. 1. 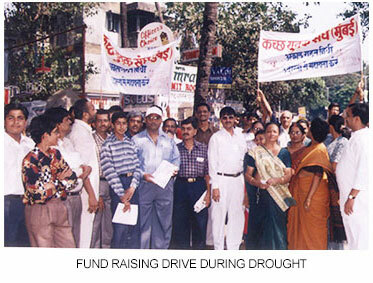 Drought : During the massive drought in Kutch between 1986-1988, sanstha raised a good amount of fund from Mumbai which was used for the relief work related to natives of kutch and to save the animal wealth in kutch. Even financial help was sent to ‘sarva seva sangh’ which is running an animal shelter at kutch. 2. Kandla Cyclone : As soon as the news about Kandla cyclone broke out, volunteers of the Kutch Yuvak Sangh reached kandla and got involved in the relief work without wasting even a second. To match to the relief work to the drastic situation post the cyclone all the sansthas associated with kutch had to be brought under one roof and kutch yuvak sangh played a very important role in this and ‘Akhil kutch sankat rahat samithi’ was formed which later got recognition as ‘Kutch NavNirman Abhyan’. Grains, clothes and medicine were provided to the people of affected region. An amount of Rs. 11,30,000 was collected and given to 435 cyclone affected farmers. 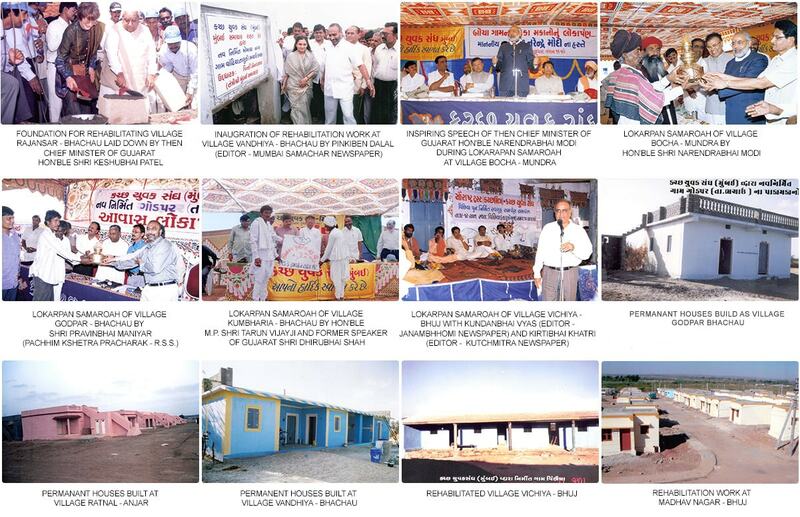 In Bhachau district itself 165 houses were built in 14 villages and rehabilitation work was accomplished. 3. Earthquake : There is a unique quality of Kutch yuvak sangh - when it comes to handling the relief work post any natural calamity and that is as soon as the news breaks out of any such calamity volunteers will leave any important work and participate in the relief work immediately. Same happened on the day of 26th January 2001 when the destructive and massive earthquake hit the Kutch region. Within 2 hours emergency meeting of all the eminent kutchi personalities in Mumbai was held and the Seriousness of entire event was discussed. Next day in special flight volunteers of the sangh headed to Kutch and started the relief work in various phases. Phase 1 : A team of doctors and volunteers headed to kutch from Mumbai. They joined the relief work from 27th afternoon. Relief camps were set up in Bhuj, Bhachau and Mundra Taluka. Grains, clothes, medicine and blankets were distributed immediately. Information centers were setup at the Mumbai airport and the railway stations and the information about various hospitals and other needs required was given to the affected people and their family members. Phase 2 : Earthquake affected regions were visited and the toll of the disaster was calculated. Around 260 villages were totally and around 200 villages were partially damaged. Tents were setup for the affected people. Kitchen was setup for them. Even temporary schools were built and studies of affected children were resumed. Along with this in Bhachau and Adhoi taluka Semi- permanent houses were built and out of prime minister Relief fund Khodsar dam was repaired. Even 85 new houses were built for earthquake affected natives of Bhuj living on rent and that entire colony is named as ‘Madhav Nagar’.